More than 85 percent of bathing water sites monitored across Europe in 2016 met the most stringent ‘excellent’ quality standards — meaning they were mostly free from pollutants harmful to human health and the environment, according to the annual bathing water quality report published today. Over 96 percent of bathing water sites met minimum quality requirements set out under European Union rules. It is encouraging to see that more and more bathing water sites across Europe are meeting the highest quality standards. This helps Europeans make better informed choices about the bathing sites they plan to visit this summer. It also shows the effectiveness of our environmental policies and the practical benefits to human health protection and our daily lives when excellent data collection and analysis are conducted. The report from the European Environment Agency (EEA) and the European Commission confirms a positive 40-year trend of increasingly cleaner water at beaches and swimming spots across Europe. The assessment compiled analyses of water sampled at more than 21 000 coastal and inland bathing sites and gives a good indication where the best sites with the highest water quality are likely to be found this summer. Bathing water is sampled and monitored for contamination by faecal pollution from sewage or livestock. Karmenu Vella, European Comissioner for the Environment, Maritime Affairs and Fisheries, said: 'The excellent quality of European Bathing Water sites is not by chance. It is the result of hard work by dedicated professionals. It shows the importance of nurturing EU policy that promotes green jobs. This year our European Green Week, 29 May – 2 June, will celebrate this investment. Water technicians, flood protectors, environmental chemists, waste water managers – all play an essential role in keeping bathing water quality high'. The report covers bathing water locations across the EU, Albania and Switzerland. European bathing waters are much cleaner than forty years ago when large quantities of untreated or partially treated municipal and industrial waste water were discharged into water. Alongside the report, the EEA has also published an updated interactive map showing the performance of each bathing site. Updated country reports and information on the directive are available at the EEA and the European Commission bathing water websites. All reported bathing water sites in Austria, Croatia, Cyprus, Estonia, Greece, Lithuania, Luxembourg, Latvia, Malta, Romania, and Slovenia achieved at least ‘sufficient’ quality in 2016. 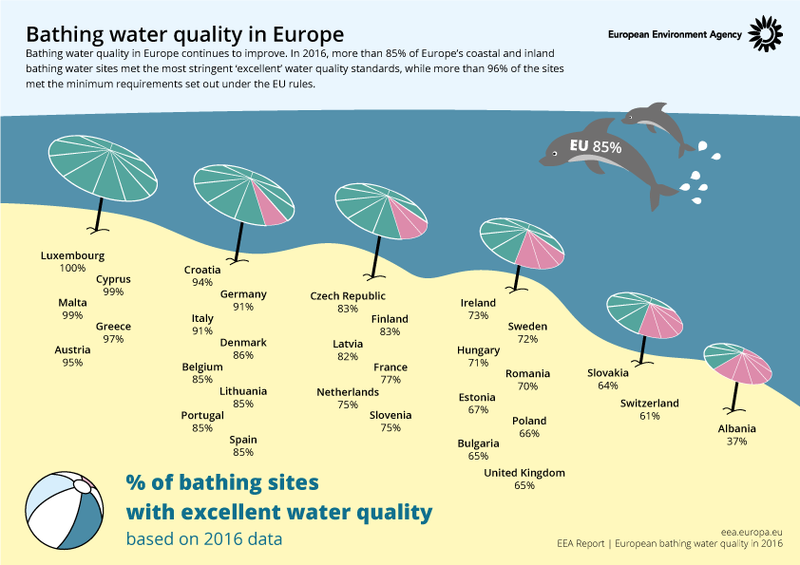 In five countries, 95% or more bathing waters were assessed as being of ‘excellent’ quality: Luxembourg (all 11 reported bathing sites), Cyprus (99%of all sites), Malta (99% of all sites), Greece (97% of all sites), and Austria (95% of all sites). In 2016, 1.5% (1.4% for EU countries) of bathing water sites were rated as having ‘poor’ water quality. Between the 2015 and 2016 bathing seasons, the absolute number of bathing waters classified as ‘poor’ dropped from 383 to 318 (from 349 to 302 for EU countries). Faecal contamination of water continues to pose a risk to human health, especially if it is found at bathing water sites. Swimming at contaminated beaches or lakes can result in illness. The major sources of pollution are sewage and water draining from farms and farmland. Such pollution increases during heavy rains and floods due to sewage overflow and polluted drainage water being washed into rivers and seas. All EU Member States, plus Albania and Switzerland, monitor their bathing sites according to the provisions of the EU’s revised Bathing Water Directive. The legislation specifies if the bathing water quality can be classified as ‘excellent’, ‘good’, ‘sufficient’ or ‘poor’, depending on the levels faecal bacteria detected. Where water is classified as ‘poor’, Member States should take certain measures, like banning bathing or posting a notice advising against it, providing information to the public, and suitable corrective measures. For references, please go to https://www.eea.europa.eu/highlights/more-european-sites-meet-excellent or scan the QR code.